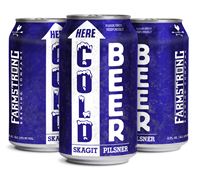 Voted Skagit County's Favorite Brewery as well as Skagit County's favorite Event/Party Venue. We consider ourselves extremely lucky to have found a home for our brewery right here in the heart of the Skagit Valley. Everything we need is right here. Most of our beers are made with locally grown and malted Skagit Valley Grain. Your entire family is always welcome here by our family. See you soon, Grow something!